There are two other prints from this series of otokodate in the collection of Waseda University. These figures can often be identified by their sword along with a bamboo flute. This is not always the case, but is frequently enough to make this iconographic clue credible. All three examples we have found from this series are wearing the same robes with a bamboo motif. 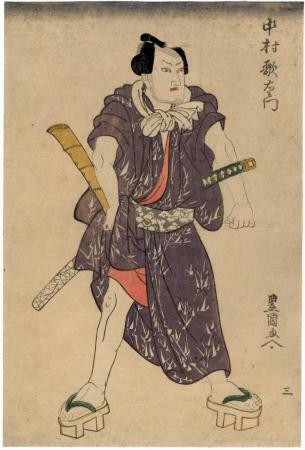 While the condition of this print from the Lyon Collection is not pristine, the robe has maintained more of its original coloration than of the two other examples at Waseda University. All three are wearing the summer obis with the same pattern, too. The sheaths and hilts of each of their swords are the same. The sheaths are designed with the cracked ice motif.